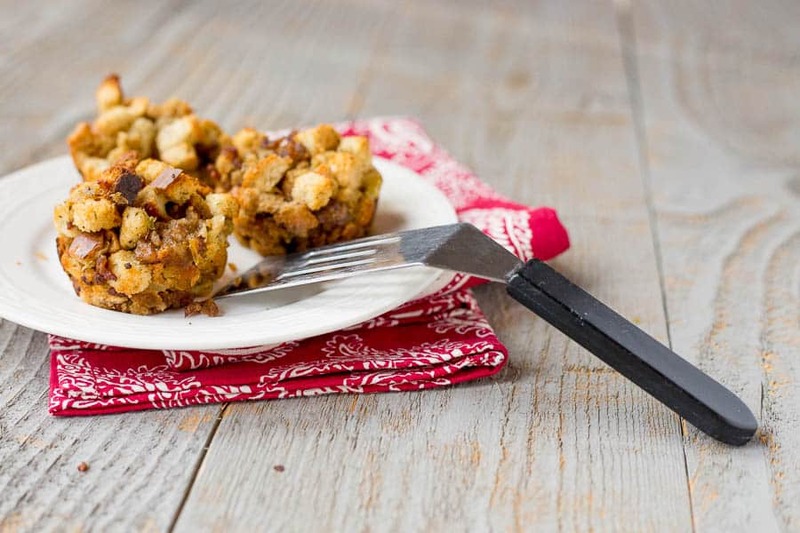 This Sausage Stuffin’ Muffins recipe is sponsored by Johnsonville Italian Sausage. 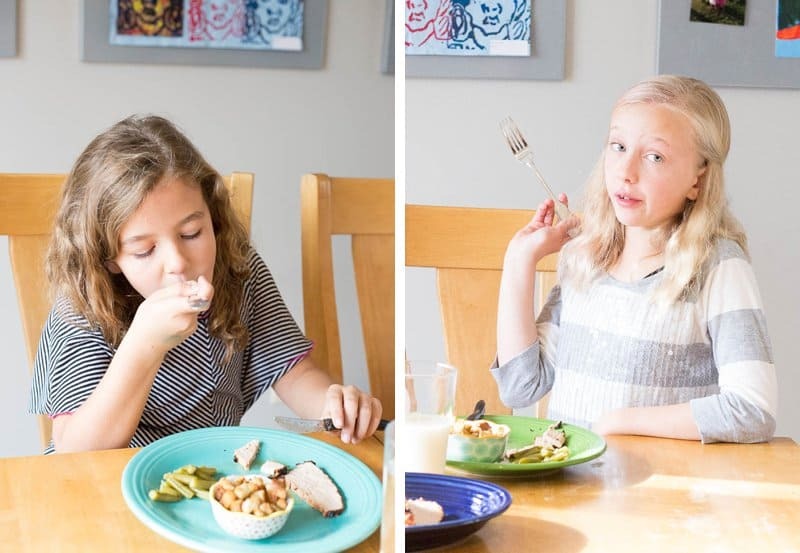 When I was a little girl, one of my favorite meals was Sunday dinner at my grandmother’s house. Except our grand dinner took place right after church — at one o’clock in the afternoon. I loved the quirkiness of this tradition. The idea of eating a big roast complete with mashed potatoes and gravy and all the trimmings of a holiday feast— during a regular ol’ lunch hour — brought me great joy. 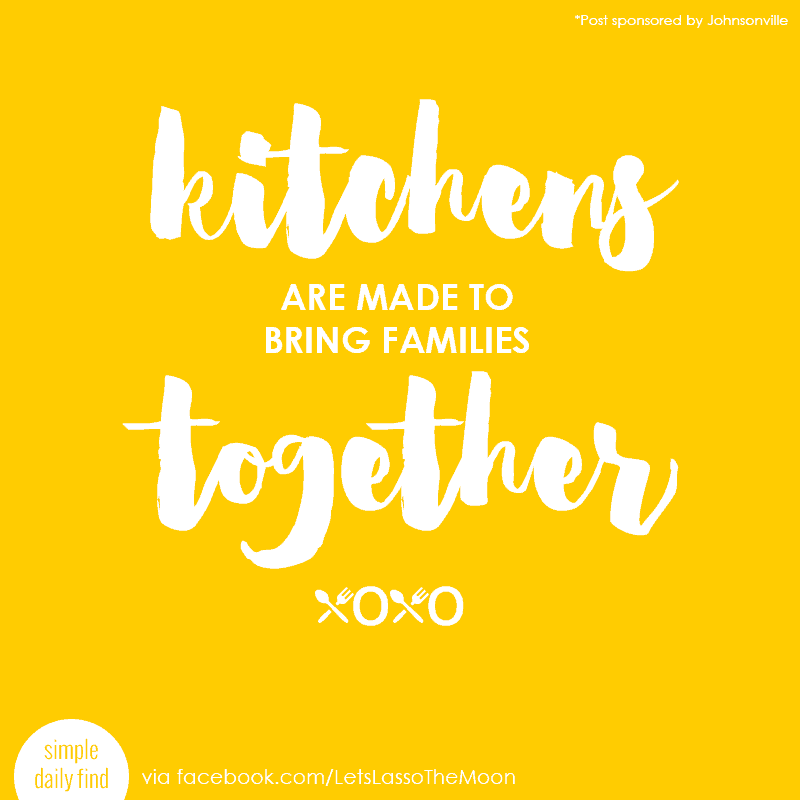 Kitchens are made to bring families together. Thinking back to when I was a child, with four children in the house, my mother and I didn’t get the chance to spend a lot of one-on-one time together. So when it did happen, I soaked it in. Some of my fondest childhood memories are of my mom and me alone in the kitchen, chopping ingredients for the holiday stuffing. She’d get up at 5 a.m. to begin work on our Thanksgiving feast every year. 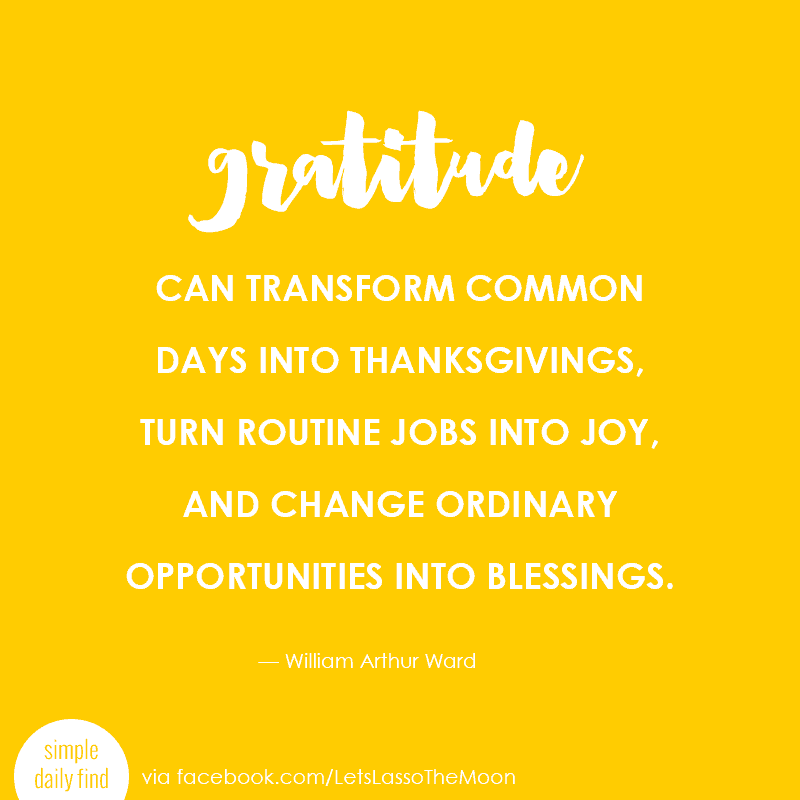 My three brothers would sleep in, leaving my mom and I to enjoy a quiet house for a few hours together as we worked away, dicing and prepping in the kitchen. Now, my mother’s home-made stuffing required chopped gizzards and the meat from a boiled turkey neck. Yeah, I know… It sounds gross, but I swear the extra meat is the secret ingredient that made it so delicious. Really. Give a try. Sausage Sunday is a day of sausage. And family. And also, sausage. Just swap out the meat from your everyday recipes and swap in delicious Johnsonville Sausage. It’s a great way to bring family together. And it tastes way better than regular Sundays. “And also, sausage.” Ha. Cracks me up. That’s so Wisconsin. Love it. I’ve used Johnsonville Italian sausage at our house in the past for, well… Italian-inspired recipes. I dig the convenience of ground Johnsonville sausage because you don’t have to de-case their sausage links (which, between the two of us — yuck). Johnsonville’s pre-ground meat is so much easier and faster. When I saw their invitation to make old classics into new favorites, stuffing immediately came to mind. I decided to experiment, and I loved the texture and kick that Italian sausage gave my stuffing. Below you’ll find our family’s recipe, which yields 12 Sausage Stuffing Muffins — as well as a side of traditional stuffing for any fuddy-duddies in your family. Here’s a few of the key ingredients we’ll be using today: celery, onions, Johnsonville Italian ground sausage. Get the Johnsonville Italian ground sausage browning on the stovetop over medium-high heat. Keep a close eye on the sausage while you start chopping the onion and celery. When my girls help me chop onions, they put their sunglasses on for the task. It cracks me up every single time. And I should probably point out, my kids hate eating onions. However, in this recipe they’re chopped fine, then sautéed and then baked. In the end, they can’t even tell they’re in there! As you brown the Italian sausage, continue to break it apart into small chunks. When the meat is completely cooked, remove to a large mixing bowl and set aside. Drain any excess grease from the pan, leaving about a tablespoon in the pan to give your sautéed veggies wonderful flavor! Sauté the chopped onions and celery with some salt and pepper for about 10 minutes (or until they start to brown and get soft). Add back in the drained, cooked meat and stir together. Your house will smell amazing from this terrific trio! To ensure your Sausage Stuffin’ Muffins turn out to be the right consistency, these next three ingredients are important… Melt 3 tablespoons of butter, set aside. Measure 2 to 2 1/2 cups of chicken or turkey stock. Then whisk 2 eggs (this extra ingredient helps bind your stuffing muffins). Pour the whisked egg and stock over the stuffing mixture and stir thoroughly. Next, drizzle the melted butter and stir well again. Then cover your bowl with foil and let the mixture sit for 5 to 10 minutes to expand. While you’re waiting, pop on the oven and preheat it to 375 degrees. Then prep your muffin tin. Brush the 12 cups with the other 3 tablespoons of melted butter. Oh, and I want to let you in on a little secret… get out your ice-cream scooper. 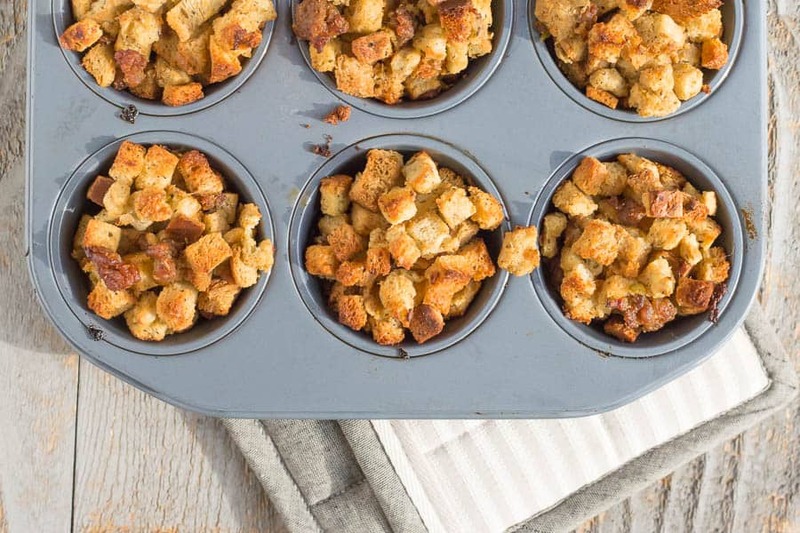 It’s the perfect tool to ensure your Sausage Stuffing Muffins are rounded and evenly sized. Place the first scoop of stuffing into the cup, then compress it with the back side of your ice-cream scooper, to ensure the bottom is full and your stuffing muffin holds its shape. 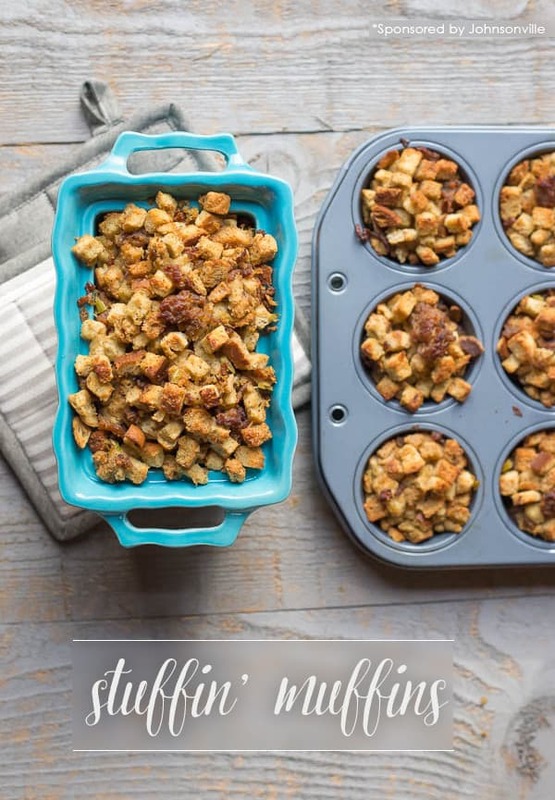 Place a second scoop of stuffing on the top, and gently press it into the cup with the front side of the scooper so the muffin holds its rounded shape on the top. 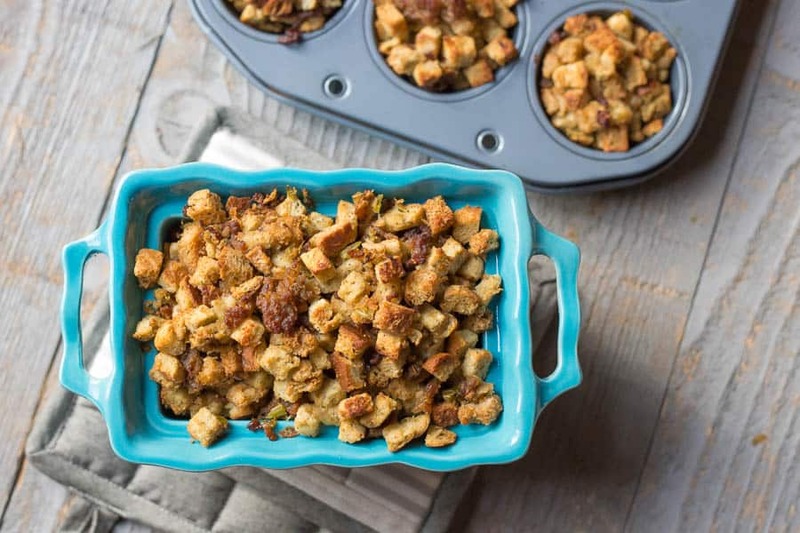 What I love about this recipe is that it’s large enough to make 12 Sausage Stuffing Muffins for the kids, plus a 9×5 bread loaf pan of traditional stuffing for any guests who prefer to dish out their own stuffing. 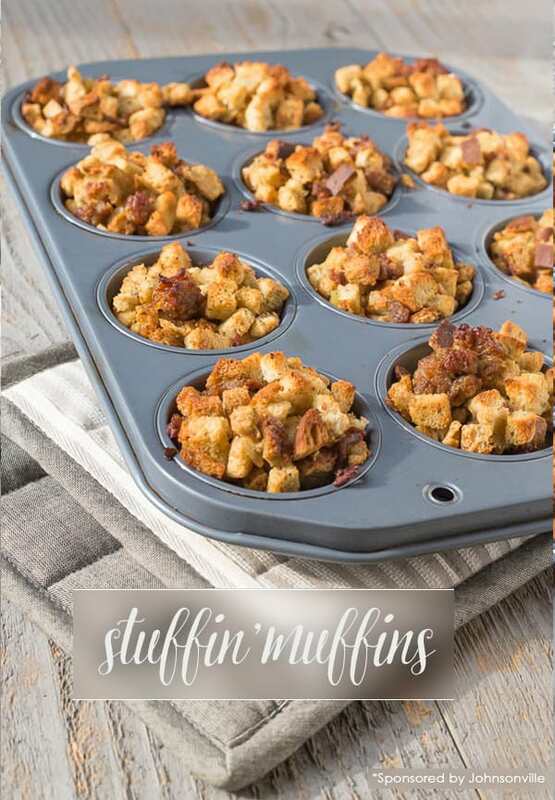 After you’ve filled all 12 muffin cups, simply place any remaining stuffing mixture into a bread loaf pan. You’re all set! Pop the muffin tin and the bread loaf pan into the oven uncovered. Bake both for about 15 to 18 minutes, until golden brown and crusty on the top. Can’t you just smell it?!? Now, your instinct might be to eat one of these puppies the moment it’s out of the oven. They smell heavenly. 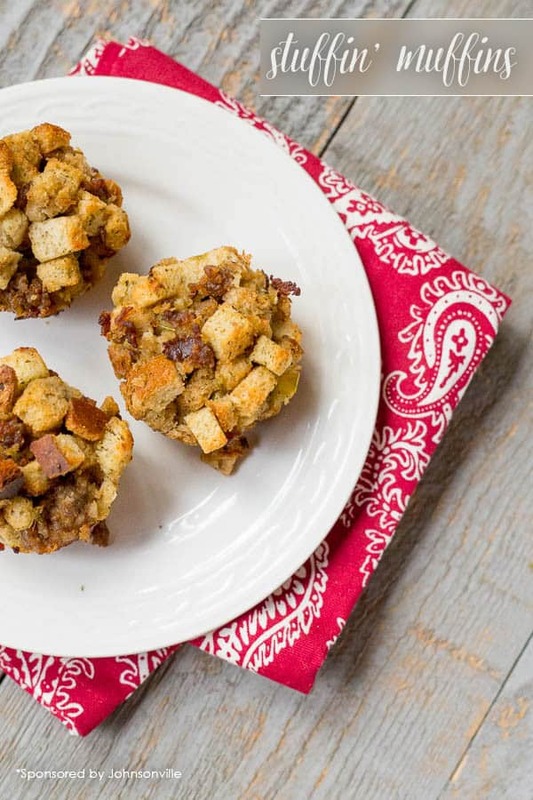 However, the Sausage Stuffing Muffins need to cool at least 5-minutes before attempting to pop them out of the muffin tin or they will lose their shape and fall apart. She replied, “It’s gooOooOood” with this you-know-it expression (below). 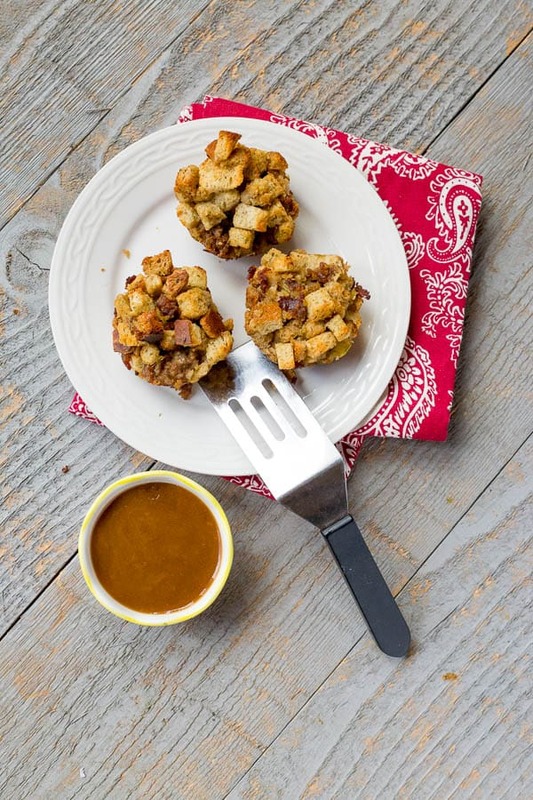 While I like the crunchy top and edge of the stuffing muffins, I also love eating them with gravy. It’s the perfect salty and savory combo. So delicious. Print the full recipe here. 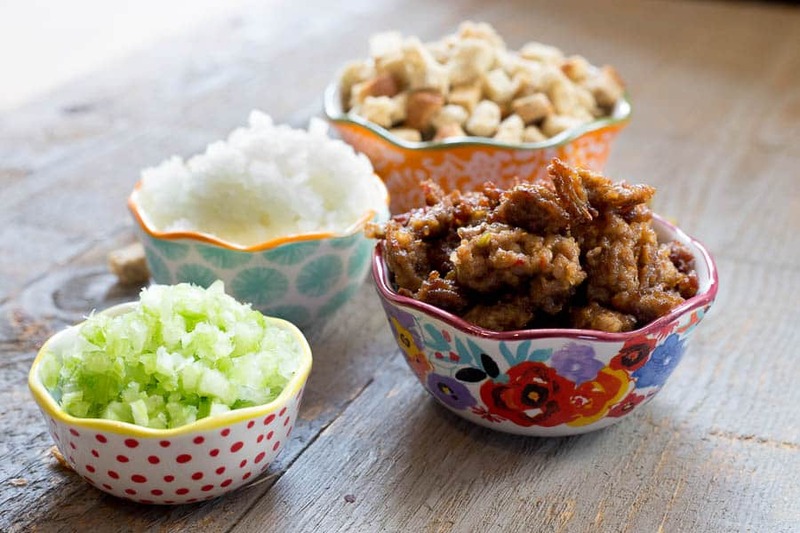 Serve stuffing anytime during the year to bring forth reminiscent feelings of gratitude. 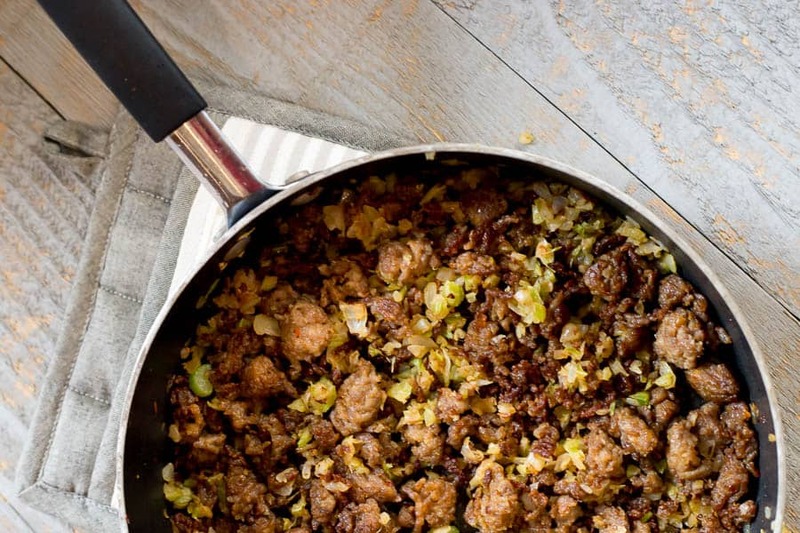 Set a large skillet over medium-high heat and brown the sausage, breaking it apart as it cooks into small crumbles. Once it's cooked, remove to a large mixing bowl. Drain some of the grease leaving about a tablespoon in the pan. Add the onion and celery, season with salt and pepper, and sauté for 8 -10 minutes, until the vegetables are starting to brown and are very soft. Add back in the meat and stir together in the pan. 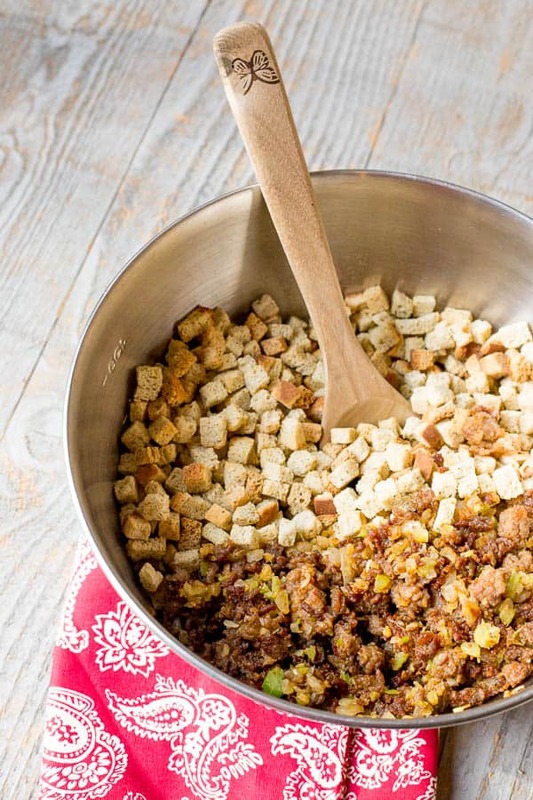 Add the sautéed mix to a big bowl of your seasoned stuffing and stir together.. Beat eggs. Then pour the turkey or chicken stock and eggs over the stuffing mix until the stuffing is evenly moist. Drizzle the butter over it and mix well. 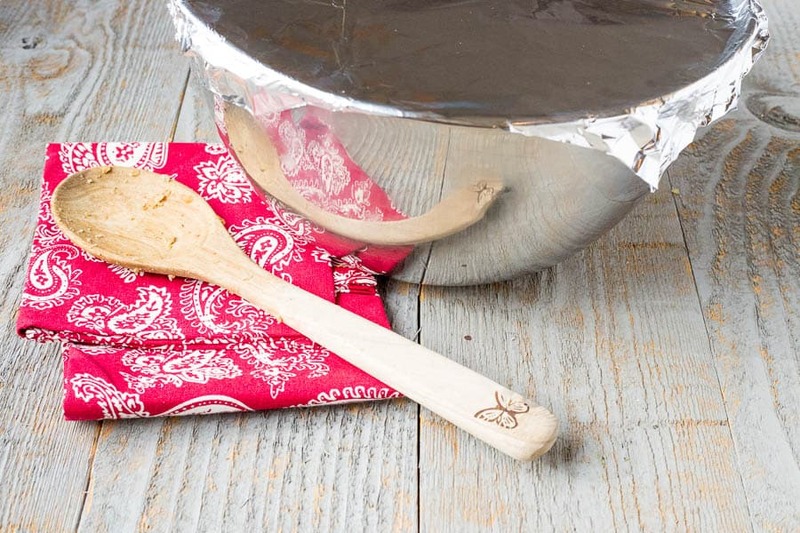 Cover the bowl with foil and let sit 5 - 10 minutes. Taste the stuffing and season with salt and pepper if needed. 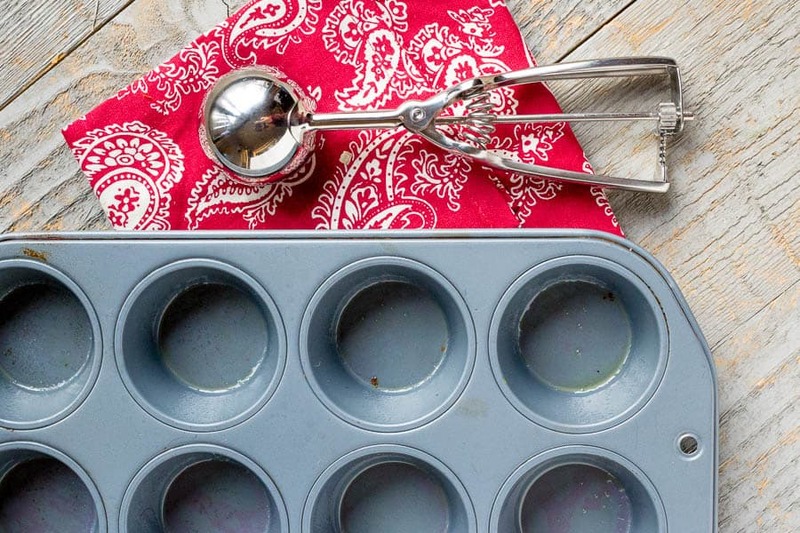 Brush 12 muffin cups with melted butter. 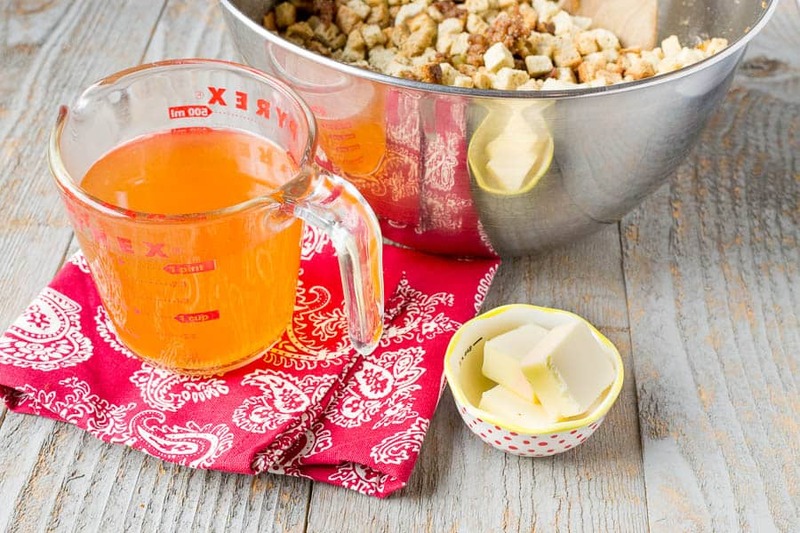 Use an ice-cream scoop to evenly fill the cups with stuffing. Press down to compress stuffing to ensure proper muffin shape. Spoon the remaining stuffing into the loaf pan. Cut a tablespoon of butter into small pieces and dot the top of the stuffing with it. Bake until the tops are golden brown and crusty, 15 to 18 minutes. Let cool 5-10 minutes before serving warm. You can add diced apples, pears, dried cranberries or cherries, fresh herbs, or even pecans. Prepare stuffing as above. Remove from muffin cups and cool. Transfer to large covered container; cover and chill up to 24 hours. 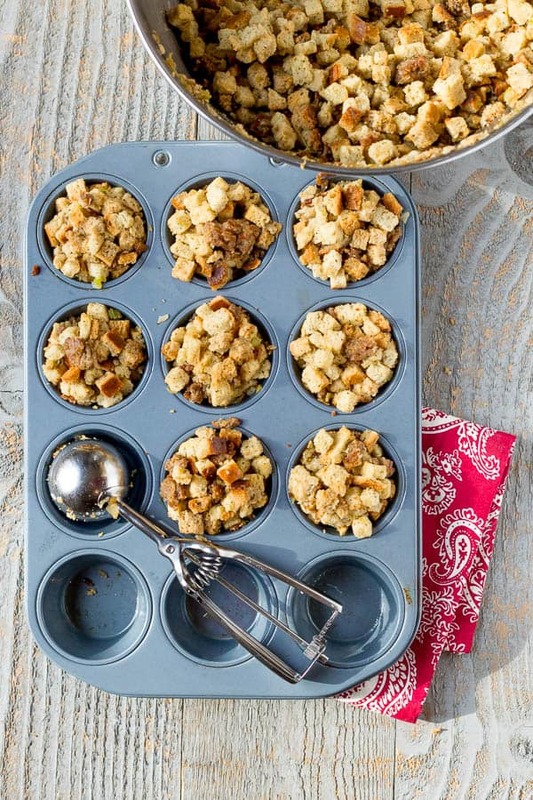 To reheat, transfer stuffing muffins to a 13x9-inch baking pan; cover with foil. Bake in a 400 degree oven for 10 to 15 minutes or until heated through. So, I’m always searching for recipes and inspiration to keep our Sunday dinners rolling along. Follow my Meal Planning and Creative Family Kitchen Pinterest boards to check out some of the recipes I’ve saved already. And be sure to follow Johnsonville on Pinterest for ongoing family recipe ideas. They’ve got a great collection there, too. PS: Thanks again to Johnsonville Italian Sausage for inspiring this new family favorite. Disclosure of Material Connection:This is a “sponsored post.” The company who sponsored it compensated me via a cash payment, gift, or something else of value to write it. Regardless, I only recommend products or services I use personally and believe will add value to my readers. I am disclosing this in accordance with the Federal Trade Commission’s 16 CFR, Part 255: “Guides Concerning the Use of Endorsements and Testimonials in Advertising.” This is a sponsored conversation written by me on behalf of Johnsonville Italian Sausage. The opinions and text are all mine.